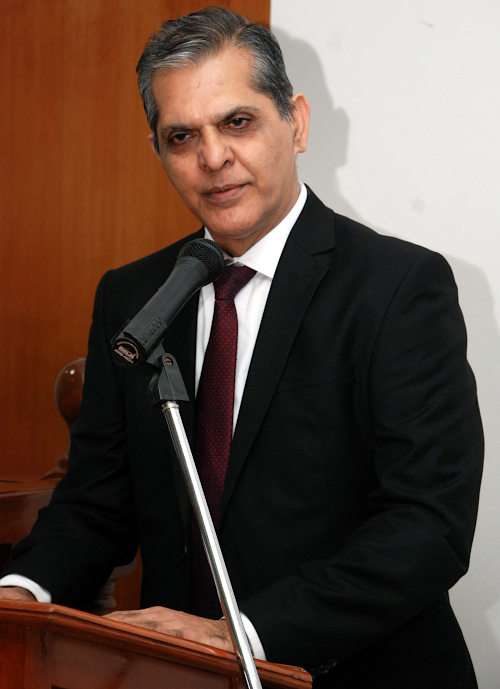 A full court farewell function was held on 31-1-2019 on the occasion of retirement of Honourable Mr. Joginder Singh Vice–President, ITAT, Chennai, on superannuation. 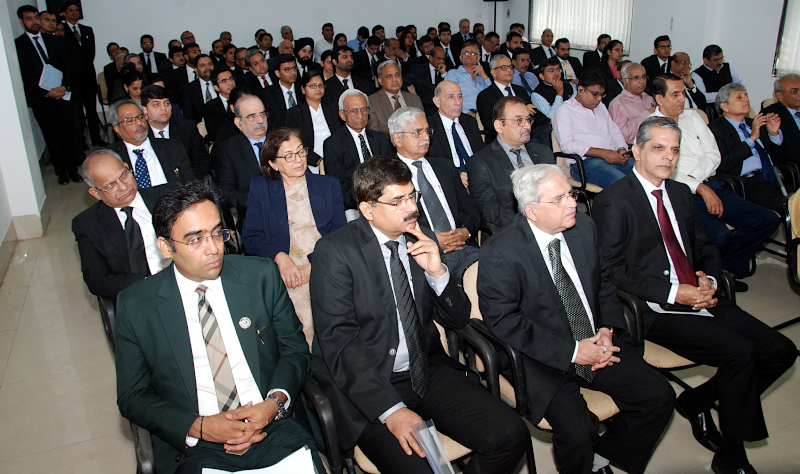 Honourable Vice-President Mr. G. S. Pannu welcomed the members of the Bar, departmental representatives and family members of Mr. Joginder Singh Vice–President, ITAT, Chennai. “We have assembled here this morning to bid farewell to Hon’ble VP Mr. Joginder Singh who is laying down office today. The Hon’ble VP has a profound knowledge of and practices yoga. He has done a lot of good work in this field, particularly in the city of Indore. He believes that everyone must take out that one hour for themselves and do yoga. It will work wonders. He exercises great control on his diet and is of the view that one should eat food as a medicine, else medicine will become your food. This combination of yoga and diet control, to my mind, makes the Hon’ble VP one of the fittest members to retire from the Bench. While on the Bench, he always referred to us as learned AR, learned counsel. That’s very normal. But what was noticeable was that he did not do this just once. Each time he addressed us during the course of the hearing, he never missed using the word “learned”. This courtesy was always extended by him. Speaking of adjournments before him, I remember an incident while I was present in his Court about 2 months ago. A young CA was before him for an adjournment. The Hon’ble VP noticed that she was not having even the basic papers relating to the appeal. He sternly asked her a few questions like why do you want an adjournment, what is the issue, why has the learned AO made the disallowance? Since she answered the questions satisfactorily, he granted the adjournment and said, “beta, agli baar papers ke bagair mat aana”. Personally, I found this quite heartening.How we treat juniors speaks a lot about us. As regards passing of orders, when we met the Hon’ble VP yesterday, he pointed out that he dictated 95% of the orders on the day of the hearing itself. Only the balance 5% which may be group cases or very complicated ones, took a few more days. “Over the past few years we have had the benefit of experiencing his persona in the courtroom. He has always come across as a simple unassuming person, intent on discharging the responsibility cast upon him, that of dispensing justice. His love for yoga made him a disciplined person and one experienced that in his conduct of the court proceedings. At times he expressed himself with some sternness but that was only to ensure that the motto of the institution of speedy justice was adhered to. He was always fair to representatives on both sides. “I feel honoured on being invited to deliver farewell address on behalf of the Income-tax Dept. in the honour of Shri Joginder Singh, Vice President, ITAT, Chennai with H.Qrs. in Mumbai, who is superannuating today after putting in 19 years of illustrious service in various capacities in ITAT Benches in various parts of the country. 2. Shri Joginder Singh was born on 1st Feb., 1957 in Haryana who after obtaining degree in Law from Delhi University, practised in Delhi as Advocate from 1983 till 2000 before joining ITAT, Bangalore in the year 2000.After working in various Benches across the country, Shri Singh was posted in Mumbai in July, 2014.In his career as Member and thereafter Vice President of ITAT spanning for almost 19 years, he has always been known for his outstanding work. As many of you are aware, his landmark judgements are quoted not only in various judicial pronouncements, but also, are reservoir of knowledge for students of Taxation Law and also, if I am allowed to be candid, for Income-tax Department and Departmental Representatives like me as well. 3. Sir, I consider myself fortunate to be a Departmental Representative in some of the Benches you had presided. Your energy level while presiding the Bench is just infectious and unmatchable.I can tell you with utmost honesty, you used to give patient hearing to both sides and always stood judicious in taking decisions. The other day, you were hearing a case of a charitable organisation whose petition u/s. 10(23C) was rejected by the Department.On merit, there was no case of this Trust before ITAT as well, according to me which you had also echoed during the proceedings. But what I really liked the most about you was the way you conveyed this to the Counsel of the assessee. I recollect, you with humble gesture, politely told the counsel of the assessee that though the Trust was working for noble causes and you acknowledge the same, your hands are tied because of legal position.There was no occasion to say like this.But you did that because that’s what you are.Yes, your humane face. 4. I have always maintained that I.T. Dept. is one of the stake holders in the working of ITAT. The Dept. is changing from intrusive to non intrusive regime. Hence, we are trying to redefine our approach in dealing with ITAT matters. We are trying to collaborate with ITAT in order to ensure full justice to the tax payers and I.T. Deptt. as well.Sir, I can vouch you always encouraged such collaboration whenever we appeared before you. 5. Sir, your name is Joginder, which means a person establishing union with God (Ishwar se jodnewala). This also means ruler of Jogis. This is also a name of Lord Shiva.I feel no hesitation in saying that your divine presence will be felt by team Income-tax in many years to come. 6. It is said that on completion of youth phase of life, life also begins at 40.Seeing you in the pink of your health and also the energy level you exhibit, I can say life also begins after 60 ( 62 to be precise). “It is indeed my privilege to participate in this Full Court Reference organized to bid farewell to my colleague Brother Joginder Singh, Vice-President (Chennai Zone), who is retiring from the Tribunal on superannuation today. This occasion gave rise to two sets of emotions, viz. separation and satisfaction. We will no longer be benefited with the judicious approach of our esteemed colleague, Shri Joginder Singh Ji in the cases being argued before the Tribunal, and therefore, missing a great colleague at work, and, at the same time, a loss to the Institution as we shall be deprived of his valuable suggestions and matured advice. However, the satisfaction is that Shri Joginder Singh Ji has completed his long and illustrious career at Income Tax Appellate Tribunal for almost about two decades. He joined Income Tax Appellate Tribunal as a Judicial Member on 24.07.2000 and was promoted to the post of Vice President on 16.10.2018, having charge of Chennai Zone with HQ at Mumbai.He has been very hard working and totally committed to the job assigned to him.He has rendered effective assistance in the process of establishment of Circuit Bench at Dehradun in Uttarakhand. He expedited the process by effective co-ordination with senior officers of CPWD in finalization of rent of the premises allotted by the State Government for setting up Bench at Dehradun.He has also extended help in other administrative matters of ITAT wholeheartedly, as and when required.His contribution as Member and then as Vice President is notable and remembered by all concerned. Brother Joginder has a multi-faceted personality. He joined professional career as an Advocate in the year 1983 after having completed LLB from University of Delhi.Moreover, he has been an outstanding national level sportsman and very good player of Kabbadi, Kho-Kho and baseball as well as a staunch supporter of Yoga.It is praiseworthy to mention here about his outstanding contribution in the field of sports as he was Chairman of Haryana State Kho-Kho Association for about 15 years, as also National Level Coach & Member of Selection Committee for Indian Team in Asian Kho-Kho Championship for five years. As President of this Tribunal, the superannuation of a VP/Member and his departure is a sad moment for me.Brother Joginder’s retirement makes the working strength of Tribunal poorer; but the Institution is larger than individuals; it goes on, taking everything in its stride. His children, both son and daughter, are practicing advocates and are well settled in their lives. I do not know if he has any specific plans for his retired life, but this much I am sure, that he will be actively associated in some way with the tax laws, making his contribution in some useful manner. Superannuation in government service is inevitable and I feel it is just the end of one phase of life and beginning of another phase. I am sure Brother Joginder would continue to contribute to the society in his new phase of life which begins from tomorrow. I wish Brother Joginderand all his family members good health, happiness and peace of mind“. Ms. Prathista Singh, Daughter of Mr. Joginder Singh, also highlighted various qualities of Mr. Joginder Singh, which showed everyone the other side of the Honourable V. P. i.e. the humble person he is outside the temple of Justice and the Man of Discipline when it comes to discharging his duties. 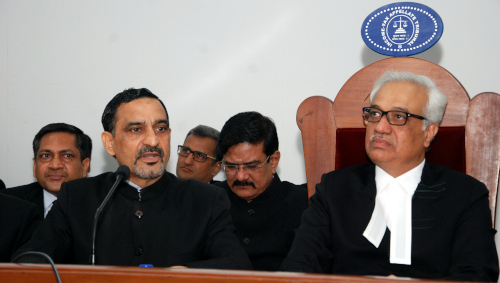 Speaking on the occasion, Honourable Mr. Joginder Singh, Vice-President, greeted all the dignitaries on the dias and also the professionals and others who attended the full court reference on 29.01.2019. The Honourable Vice President further mentioned about his strong urge to help the juniors since they being the future pillars of the ITAT institution, need to be guided in their initial phases of the career. Honourable Vice President also gave valuable information about how to keep BP (Blood Pressure) in control. Having in-depth knowledge about YOGA and natural Herbal Medicines, he took the opportunity of the full court gathering to guide every person to have a healthy life style and gave a few important health tips. Honourable Vice President then concluded by thanking everyone present there. On eve of the superannuation, the ITAT Bar Association hosted the High Tea at the Member’s library in honour of Vice-President Mr. Joginder Singh, which was attended by Honourable Members of the ITAT, members of the Bar, departmental representatives and family members of Honourable Vice -President Mr. Joginder Singh. Practicing Yoga and meditation daily .. This is a very, very nice suggestion. Physical and mental health is essential for all. Since childhood children must be trained to practice different types of Mudras, Bandhas, Pranayama, Asanas and meditation. By this after meditating for nearly 10,000 hours they will have stable mind.